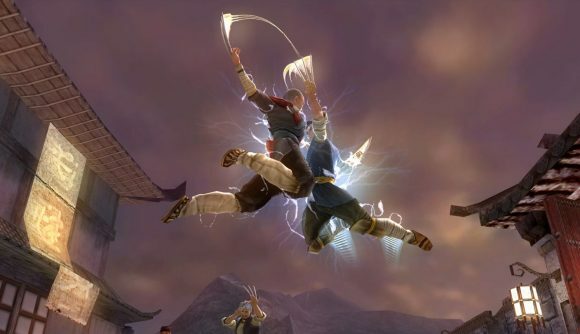 EA has submitted a new trademark application for the Jade Empire franchise, possibly signaling a return of BioWare’s martial arts RPG. The application was submitted January 25. Before we get too excited about the possibility of a new Jade Empire game, it’s important to remember that companies file for trademark applications as a routine matter of maintaining intellectual property rights. EA acquired BioWare in 2007, two years after the Xbox 360-exclusive release of the original Jade Empire. So, it’s entirely possible that EA is simply doing some administrative upkeep on the library of intellectual property it acquired along with BioWare. On the other hand, however, if EA were to make a new Jade Empire game, filing for a trademark would be one of the steps they’d need to take along the way. The Jade Empire trademark application was filed as “Goods and Services,” specifically “Entertainment services, namely, providing an on-line computer game; Provision of information relating to electronic computer games provided via the Internet.” It’s easy to read that as meaning some kind of multiplayer or always-online game, but what it most likely means is simply a game that can be purchased and downloaded online. However, it’s worth remembering that EA filed for the same kind of trademark – among others – back in October for Apex Legends, the Titanfall-based battle royale which we’ve learned is probably going to be both revealed and launched tomorrow, February 4. For its part, BioWare currently has its hands full with Anthem’s imminent launch, and it seems likely that it’ll be keeping them occupied for quite some time to come. Still, BioWare likely has teams working in parallel, and there’s nothing preventing the studio from devoting one to pre-production on a new Jade Empire title. Jade Empire was ported to PC in 2007 and you can still pick up the special edition on Steam and GOG. It was BioWare’s first original setting, having worked until that time on franchises like Star Wars and Dungeons & Dragons. When the company was acquired by EA, a Jade Empire sequel was mothballed to make way for a series we now know as Dragon Age. Perhaps now it’s time to bring that baby out of cold storage.